A growing number of academics say that they plan to leave the country's notoriously left-wing campuses to join the federal judiciary. These pink-hued professors say that they now see judicial activism, not the conversion of students, as the most promising method of advancing their political agenda. BOULDER, CO—The fate of infamous left-wing professor Ward Churchill is currently in the hands of a peer review committee here at the University of Colorado. 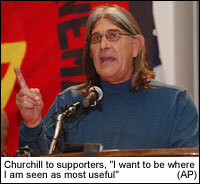 But sources close to the professor, the most recent poster child for our far-left colleges and universities, say that Dr. Churchill may not want his job anymore. Instead, he's got his sights set on a new career—as a federal judge. "He sees the federal judiciary as being a better place for his kind of activism than a college campus has turned out to be," says a source close to the former chair of the ethnic studies department. "Higher education is kind of played out as far as he's concerned." Dr. Churchill isn't the only professor who is reportedly considering trading in his pipe and tweed blazer for a gavel and long black robe. Experts say that academics from such left-wing outposts as the University of California at Berkeley to New York's Columbia University have plans to give up academic research in order to pursue the hottest trend on the left: rewriting laws and remaking culture from the federal bench. 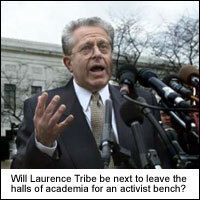 What's behind the academic exodus from the ivory tower to the marbled halls of unchecked judicial power? Experts say that university professors who once flocked to academe with dreams of converting individual students to their left-wing worldview or weltenschaung have grown impatient at just how long such a process takes. Winning over new students each quarter or semester, say experts, takes time, eating into weekends, holiday breaks and sabbaticals. By contrast, activist judges are able to remake the law of the land with a single outrageous decision, requiring comparatively less exertion than teaching a course, giving a fiery left-wing speech, or even holding a one-on-one conversion session with an individual student. A recent survey of more than 500 faculty members at some of the country's best known—and most feared—institutions reveals that as many as 23% of academics plan to make the transition from activist professor to activist judge in the coming years. The most coveted position for these federal judge wannabes: the Ninth Circuit Court of Appeals, responsible for a 2002 decision that declared the Pledge of Allegiance unconstitutional due to its invocation of God. Several professors-turned-activist-judges are said to be eager to pass laws from the bench that would make breaching the wall between church and state a federal crime, complete with mandatory sentencing requirements. A recent poll has found that the majority of Americans now fear activist judges more than any other single threat, including toxic mold, illegal aliens, alien abduction or North Korea. That terror of activist judges has greatly escalated in recent years. As recently as 1998, only 15% of Americans said that they were afraid of activist judges, while 62% reported that out-of-control professors represented the biggest threat to the nation. Oooh! Oooh! Plus, they get to keep the whole tenure/life-time appointment thingie! And the robes are similar to the ones from commencement, so they get to keep large parts of their wardrobe. Although, on the downside, you neglect to mention how much concern there has been in the academic community about rubbing elbows with the lowest form of human life: the lawyer. Criminals: got cachet and panache, usually oppressed. Lawyers: bourgeois, slimy, sweaty, oppressive.